DENTON – The No. 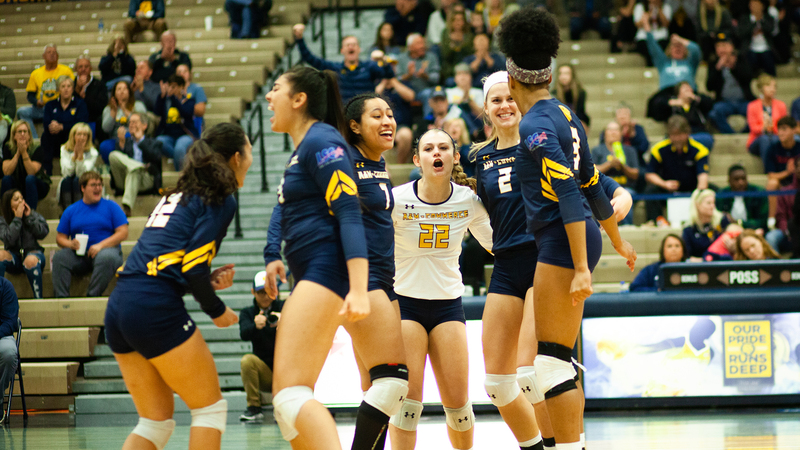 22 Texas A&M University-Commerce volleyball team won the final two sets to take a 3-1 victory over Texas Woman’s University in Kitty Magee Arena on Tuesday night. Set scores were 25-14, 17-25, 25-15, and 25-17. With the win, the Lions move to 19-5 overall and 11-3 in the Lone Star Conference, while the Pioneers are now 14-10 overall and 6-8 in the LSC. The Lions have one more LSC match this week, taking on Texas A&M-Kingsville on the road at 7 p.m. Friday. – The Lions hit .258 in the match with 49 kills while limiting the Pioneers to a .091 hitting percentage. – Celeste Vela (Guadalajara, Mexico) was a dig short of a triple-double with 10 kills, 15 assists, and nine digs. – Madison Luther (Sealy) also had 10 kills against only one error, hitting .409 in the match. – Jaslyn Wacker (Austin – Vista Ridge) was error-free in the game with nine kills on 13 swings for a .692 hitting percentage. – Bina Njikam (Keller) had nine kills and a team-high six blocks. – Savannah Rutledge (The Woodlands – College Park) had 20 digs, and Riley Davidson (Commerce) had 11. – Rylie Fuentes (Robinson) passed out 29 assists. The Lions went on a massive rally in the first set to pull away early and keep TWU from threatening. The Pioneers had an early 4-2 lead before A&M-Commerce rattled off 12 consecutive points on Fuentes’ serve to push out to a 14-4 lead. TWU could not get closer than six points in the rest of the set, and the Lions closed by scoring six of the final eight points. Luther had five kills and Vela had four, as the Lions hit .306 in the frame. Rutledge had 10 digs in the set to keep Lion rallies alive. The Pioneers had the big run in the second set to even up the match. TWU led 7-6 and scored 10 of the next 13 points to take a seven-point advantage. The Lions were held at arm’s length for the rest of the set, hitting only .100 in the frame. Fuentes’ serve was the catalyst for the Lions in the third set as well. Texas Woman’s had a 13-9 lead when the Lions stepped on the gas. A&M-Commerce scored nine straight points to take an 18-13 lead, then scored seven of the final nine to put the set away. All told, the Lions scored 17 of the last 19 points in the set, hitting .241 in the frame and limiting TWU to minus-.065. The fourth and final set was the most evenly played of the four, but the Lions left no doubt of their superiority in the late stages. After going up 14-13 and calling timeout, the Lions finished 11 of the final 15 points. A block by Njikam and Luther put the emphatic close to the match. The offense was clicking throughout, with 12 kills against only one error for a .478 hitting percentage. 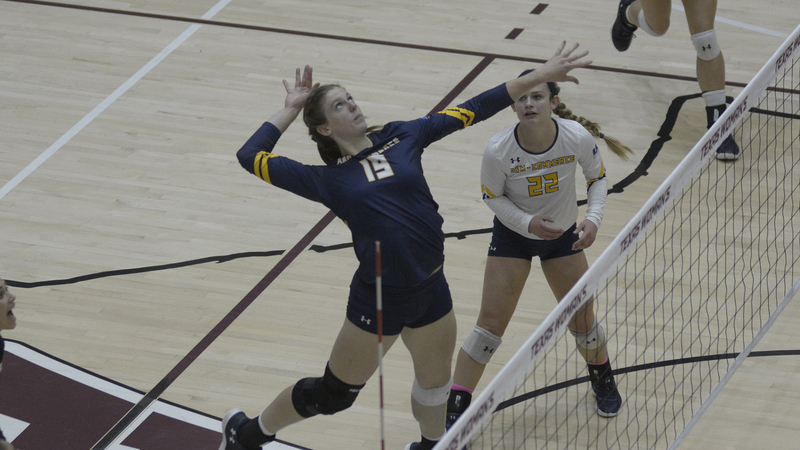 RICHARDSON– Texas A&M University-Commerce volleyball player Shelley Chapron has been named the Lone Star Conference Offensive Player of the Week. It is the third time Chapron has been named Player of the Week this season. The award was announced by the conference office on Tuesday. 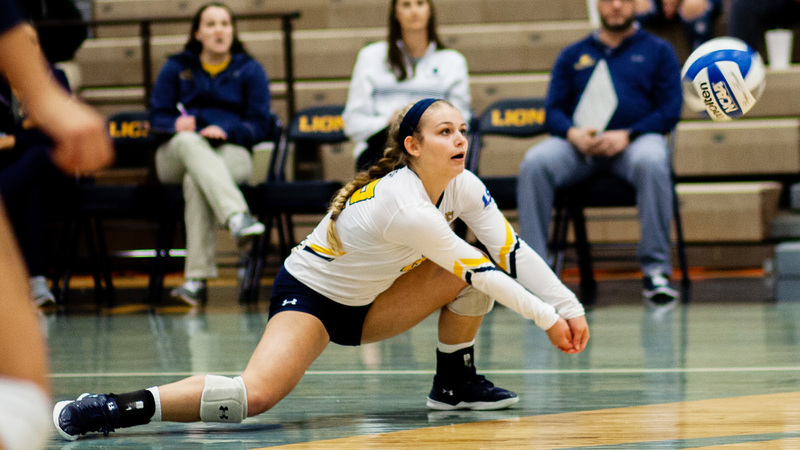 Chapron- a junior from Houston (St. Pius X)– was a force for the Lions, hitting .467 while recording double-digit kills in each of her three matches last week. She had 10 kills and no errors in the Lions sweep of MSU Texas, hitting .526 in the game while also totaling four blocks. She then had 11 kills against Tarleton State. She finished the week with 10 kills and no errors while hitting .714 in the A&M-Commerce sweep of Angelo State. Chapron continues to lead the conference in slugging percentage (.418) and is fourth in the conference in both total kills and blocks. Chapron and the No. 22 Lions return to the court tonight for a road match against Texas Women’s at 6:00 pm in Denton. The Lions will then face Texas A&M-Kingsville on Friday at 7:00 pm in Kingsville. WICHITA FALLS – The Texas A&M University-Commerce men’s golf team closed out the fall season with their third-best round of the year to finish in a tie for second at the Midwestern State Invitational on Tuesday. The Lions shot a 1-over par 285 Tuesday, finishing the tournament with a 54-hole total of 889 (305-299-285, +37) to tie Arkansas-Fort Smith for runner-up. MSU Texas won the event at 855 (+3) on its home course. Lucas McCubbin (Midland) was the Lions’ top placer, tying for third at 2-over par 215 (74-71-70) for the event. He shot 1-under in Tuesday’s round, carding four birdies throughout the day. Blake Hartford (Spring – Klein Collins) earned a top 10 finish, placing seventh at 10-over par 223 (75-76-72). His 1-over round on Tuesday had two birdies. Jonathon Welch (League City – Clear Springs) had a career-best round of 68 (-3) Tuesday with five birdies throughout seven holes. He finished the event in 11th at 11-over par 224 (80-76-68). Joe Wolcik (Cleveland – Tarkington) placed 27th at 231 (76-77-78), and Zach Burch (Lubbock – Cooper) placed 32nd at 232 (81-76-75). This event concludes the fall portion of the Lions’ competitive schedule. 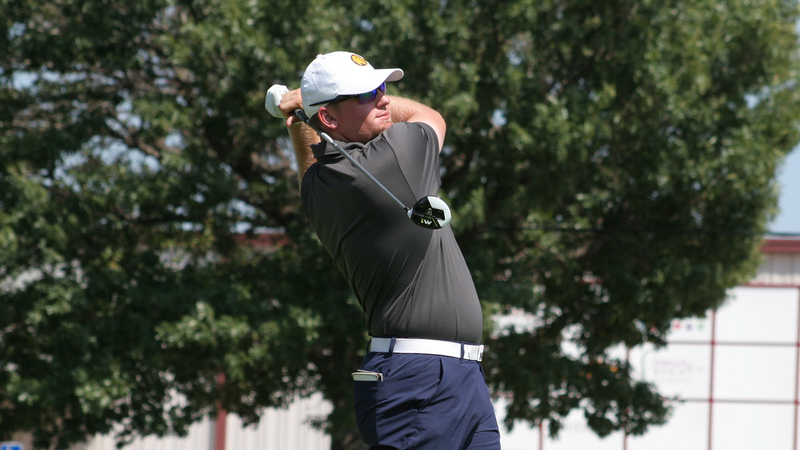 A&M-Commerce earned two top-five finishes in the fall. The Lions return to competitive action on February 25-26, 2019, in San Antonio at the St. Mary’s Rattler Invitational. 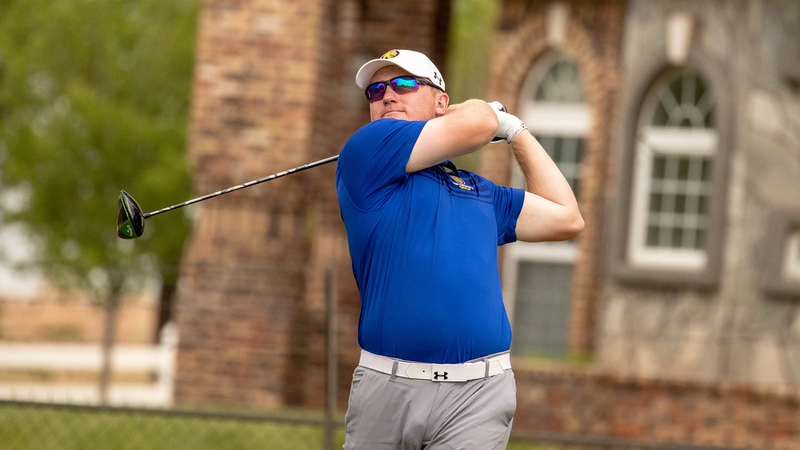 WICHITA FALLS – The Texas A&M University-Commerce men’s golf team is in third place after 36 holes at the chilly Midwestern State Invitational on Monday. The Lions shot 604 (305-299, +36) and are two strokes behind Arkansas-Fort Smith on the team leaderboard. MSU Texas has the lead at +8. Lucas McCubbin (Midland) is in fourth place in the individual standings at 145 (74-71, +3). He shot even par in the second round and had five birdies on the day. Blake Hartford (Spring – Klein Collins) is also in the top 10, tied for ninth at 151 (75-76, +9). He notched three birdies throughout the day. Joe Wolcik (Cleveland – Tarkington) is in 15th place at 153 (+11), Jonathon Welch (League City – Clear Springs) is in 26th at 156 (+14), and Zach Burch (Lubbock – Cooper) is in 30th at 157 (+15). The Lions complete their final tournament of the fall schedule with 18 holes of action starting at 8:30 a.m. Tuesday. Volleyball holds at No. 22 in AVCA National ranks. 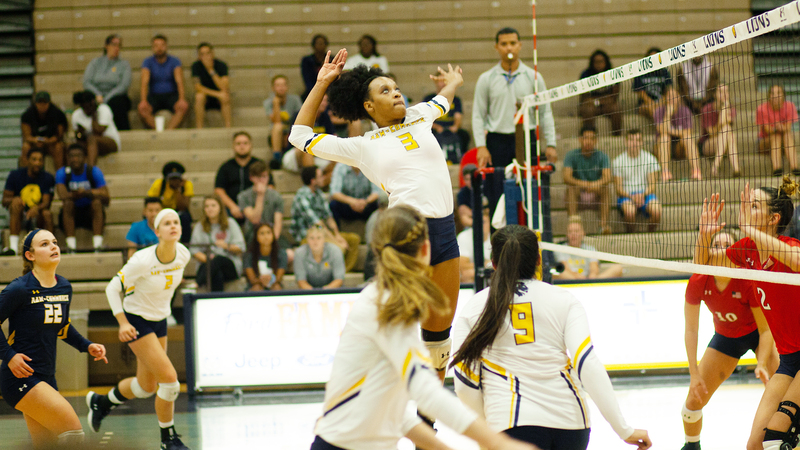 COMMERCE– The Texas A&M University-Commerce volleyball team is ranked No. 22 in this week’s American Volleyball Coaches’ Association poll. The Lions held their rank from last week’s poll. It is the seventh consecutive week the Lions have been nationally ranked. The Lions won two of their three games last week. 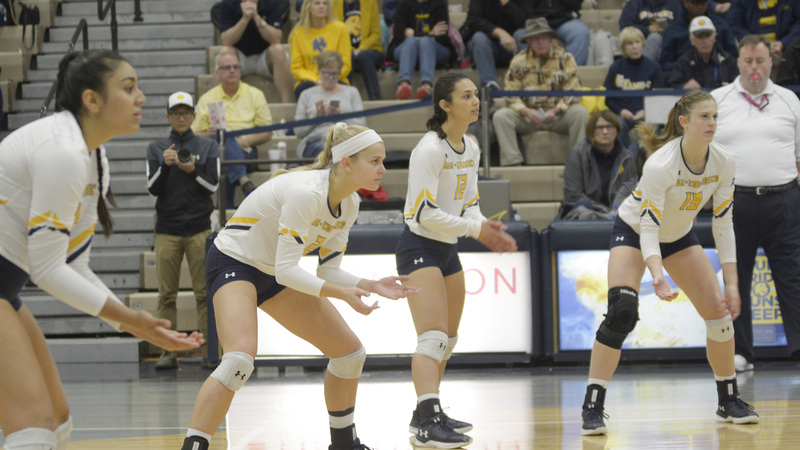 On Tuesday, A&M-Commerce swept MSU Texas on the road. The Lions then fell to No. 15 Tarleton State on Friday before rebounding to sweep Angelo State on Saturday at home. The Lions are one of two teams from the Lone Star Conference in this week’s AVCA rankings. Tarleton State is ranked 13th. The Lions have faced five teams in the top-25 rankings and have a record of 4-2 against top-25 ranked teams so far this season. The No. 22 Lions return to action on Tuesday with a road match against Texas Women’s at 6:00 pm in Denton. The Lions will then face Texas A&M-Kingsville on Friday at 7:00 pm in Kingsville. COMMERCE– The No. 22 Texas A&M University-Commerce volleyball team lost 3-1 to No. 15 Tarleton State on Friday night. The set scores were 19-25, 19-25, 25-21, 25-27. The loss brings the Lions to 17-5 on the season and 9-3 in the Lone Star Conference. The TexAnns improve to 19-2 and 11-0 in conference play. The loss broke a 20-game home winning streak for A&M-Commerce. The Lions return to action on Saturday with a match against Angelo State. The game will be played at 1:00 pm at the Field House. – The Lions had 40 attack errors in the match, hitting a season-low .084. Tarleton had 20 blocks in the game. – The Lion defense held the TexAnns to a .132 hitting clip. – Jaryn Wacker (Austin – Vista Ridge) led the Lions with 19 kills, hitting .277 in the match. Shelley Chapron (Houston – St. Pius X) added 11 kills. – Celeste Vela (Guadalajara, Mexico) led the team with 22 assists while Rylie Fuentes (Robinson) had 18. – Savannah Rutledge (The Woodlands – College Park) led the defense with 19 digs. Daniela Santos (Caracas, Venezuela) added 13. It was a back-and-forth start to begin the second set. The teams were tied at seven early. The TexAnns then went on a run, building their lead to seven points. The Lions battled back late again, cutting the TSU lead to three points. However, that was as close as they would get and again fell 25-19. The Lions got off to a 4-1 lead in the third set, including an ace and a kill from Vela. The TexAnns battled back to take four points in a row to take a 9-8 lead. The Lions responded with a 3-0 run to regain the lead. The lead swapped hands again before the Lions tied the match at 19. A&M-Commerce would proceed to score five points in a row and took the third set 25-21. Chapron and Wacker both had five kills in the set as the Lions hit .438 as a team in the frame. After trailing 2-1 to start, the Lions rattled off six points in a row early in the fourth set, including three kills from Wacker. The Lions then had a 5-1 run to take a 16-8 lead. The TexAnns then responded, earning nine points in a row to take a 17-16 lead. TSU built its lead to 21-18 before the Lions battle back to tie the match at 22. The lead changed hands three times late as the set went into extra points. However, TSU scored the final three points to win the game 27-25, sealing the match. ODESSA– The Texas A&M University-Commerce soccer team defeated UT Permian Basin 2-0 on Sunday afternoon. The Lions scored a goal in the seventh minute to take control of the match and scored a late goal to seal the win. The win brings the Lions to 7-5-0 on the season and 4-4-0 in the Lone Star Conference. UTPB falls to 1-12-0 and 0-8-0 in conference play. The Lions return home for a Friday match against West Texas A&M. The game will be played at 7:00 pm at the Lion Soccer Field. – Leslie Campuzano scored the game-winning goal in the seventh minute. It was her third goal of the season. – Karissa Rulander assisted on Campuzano’s goal. It was her third assist of the season. – Sabrina Munguia scored an unassisted goal in the 88th minute. It was her sixth goal of the season. – Cora Welch had two shots on goal, and Myca Crum had one shot on goal. Rulander also had a shot on goal. – Caitlin Duty made four saves, recording her third shutout of the season. Duty made two early saves as the Falcons came out attacking early. However, it was the Lion offense that made things happen first. In the seventh minute, Rulander found Campuzano on the left side of the box, and she fired the ball into the net to give the Lions a 1-0 lead. Rulander then had a shot on goal in the eighth minute that was saved. The Lions continued to attack with multiple shots, including a shot on goal from Welch in the 16th minute. But the effort was spared to keep the game score at 1-0. UTPB had several shots miss the mark and Duty made a save in the final minute of the half to send the Lions into halftime with a 1-0 lead. Welch had an early shot on goal in the second half that was saved. The defenses both tightened up, not allowing a shot on goal for another 15 minutes. UTPB then had a shot on goal in the 63rd minute that was saved by Duty. The Lions had several shots in a row that could not find the mark. Crum then had a shot saved in the 75th minute to keep the match a one-score affair. Munguia put the match out of reach late. In the 88th minute, she stole the ball on defense and was all alone with the goalie to beat. She took a shot from inside the box and found the back of the net to give the Lions the 2-0 victory. COMMERCE– The No. 22 Texas A&M University-Commerce volleyball team swept Angelo State on Saturday afternoon. The set scores were 25-22, 25-22 and 25-18. The win brings the Lions to 18-5 on the season and 10-3 in the Lone Star Conference. ASU falls to 17-6 and 10-3 in conference play. The Lions return to the court on Tuesday with a road match against Texas Women’s. The game will be played at 6:00 pm at the Kitty Magee Arena in Denton. – The Lions hit .279 in the match and held ASU to a .154 attack percentage. The Lions had 11 blocks in the game. – It is the eighth sweep for the Lions this season. It is the first time A&M-Commerce has swept ASU since 2006. – The Lions now have double-digit conference wins, the third season in a row they have reached 10 or more wins in LSC play. – Shelley Chapron (Houston – St. Pius X) led the Lions with 10 kills, hitting .714 in the match. – Celeste Vela (Guadalajara, Mexico) and Jaslyn Wacker (Austin – Vista Ridge) both had six kills. Jaryn Wacker (Austin – Vista Ridge), Bina Njikam (Keller) and Madison Luther (Sealy) had five kills apiece. – Vela led the team with 16 assists while Rylie Fuentes (Robinson) had 15. – Savannah Rutledge (The Woodlands – College Park) led the team with 14 digs. Vela added 10 and Riley Davidson (Commerce) had six. ASU scored the first three points of the match before the Lions responded with a 3-0 run of their own, with two blocks from Jaslyn Wacker. The teams were tied at seven before the Rambelles scored five points in a row. The Lions responded with a 4-0 run, with back-to-back kills from Jaslyn Wacker. After ASU scored four in a row again, the Lions took six of the next seven points to take the lead. The Rambelles took a 21-19 lead before the Lions closed out the set, scoring six of the final seven points to win 25-22. ASU got out to a 4-2 lead in the second set before the Lions battled back to tie at five. The teams traded 3-0 runs before trading points back and forth again. The game was tied at 13 midway through the set. The set was tied at 21 before the Lions closed out the set on a 4-0 run to take the second set 25-22. Chapron had five kills. The Lions scored four of the first five points of the third set. The Lions led by as many as five early and ASU did not climb back in. The Lions won the final two points to win the set 25-18 and sweep the match. The Lions hit .323 in the last set. COMMERCE – The No. 7 Texas A&M University-Commerce football team was within one score late in the third quarter but ultimately fell to No. 16 Tarleton State University, 47-21, at Ernest Hawkins Field at Memorial Stadium on Saturday afternoon. The Lions are now 5-2 overall and 3-1 in the Lone Star Conference, while Tarleton is 6-0 overall and 5-0 in the league. A&M-Commerce hits the road next week to take on Western New Mexico at Noon MDT (1:00 p.m. CDT) in Silver City, N.M.
– Quarterback Kane Wilson (New Orleans, La.) accounted for two touchdowns, passing for one and rushing for one. He completed 18-of-31 passes for 232 yards and a 9-yard touchdown to Vincent Hobbs (Mesquite – Horn). Wilson also had nine carries for 23 yards and a 3-yard touchdown. – Carandal Hale (Greenville) was the Lions’ top rusher, carrying the ball 13 times for 61 yards. – Marquis Wimberly (Duarte, Calif.) caught seven passes for 69 yards. – Reggie Kincade (Everman) was electric in the return game, returning a kickoff 100 yards for a touchdown. He had five total returns for 208 yards. – The Lions were outgained 486-360 and fell victim to 18 penalty calls. – Mark Westbrook (Schertz – Clemens) had a team-best 11 tackles, while Kader Kohou (Euless – Trinity) had 10 tackles, two pass breakups, and one for loss, and a forced fumble. Tarleton took the opening kickoff and drove downfield thanks to a long pass play. The Lion defense stood firm in the red zone and held the Texans to a 27-yard Joanly Martinez field goal with 11:57 left in the opening quarter. The Lions executed a long drive of their own with their first possession. A 17-yard completion from Wilson to Ryan Stokes (St. Louis, Mo.) and a 21-yard swing pass to E.J. Thompson (Cy Ranch) set up Wilson’s 9-yard scoring strike to Hobbs. The one-handed grab made it a 7-3 Lion lead with 6:32 left in the first quarter. The Texans were held on fourth down on the next drive but were able to regain the lead at 10-7 with 28 seconds left in the quarter on a 50-yard touchdown pass from Ben Holmes to Savon Rollison. Tarleton extended the lead to 17-7 with 10:46 left in the first half after Xavier Turner’s 12-yard touchdown carry capped a long drive. Kincade immediately flipped the momentum, taking the Texan kickoff from four yards deep in the end zone, then speeding up the field for the 100-yard kickoff return for a touchdown to cut the lead to 17-14. The return score was Kincade’s second career touchdown return, adding to his 99-yard score in the 2017 National Championship Game. It is the fifth 100-yard kickoff return for a touchdown in school history. Tarleton took a 24-14 lead into the locker room at halftime after a 13-yard scoring pass from Holmes to Zimari Manning. Coming out of the break, the Lions jumped on the offensive. Wilson completed a 46-yard pass to Stokes on the opening play of the half, then found Darrion Landry (Baytown – Lee) for a 19-yard completion. Wilson finished off the drive with the 3-yard scoring plunge, cutting the lead to 24-21 with 13:58 left in the third quarter. The sides exchanged punts for the next 10 minutes before a mishandled snap was recovered by Tarleton and returned inside the Lion 10. 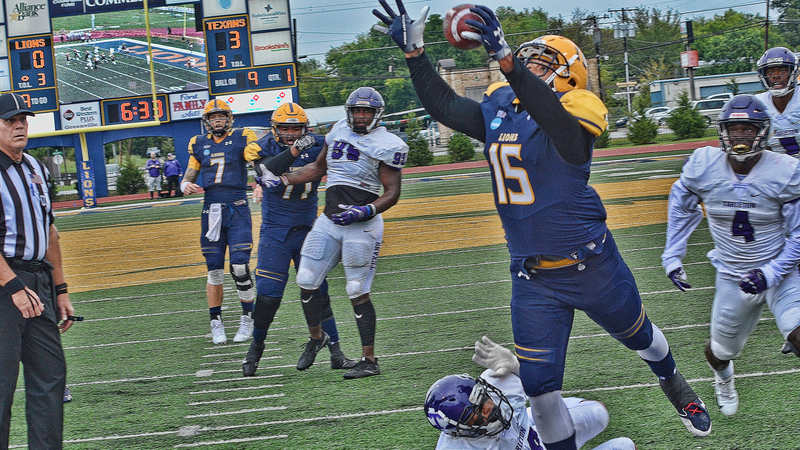 A&M-Commerce’s defense did not budge, however, and limited the Texans to a 21-yard field goal, keeping the deficit at one score – 27-21 with 3:00 left in the third quarter. Tarleton used an 11-play drive into the fourth quarter to push the lead to 33-21 on Turner’s 19-yard touchdown carry. The Lions were unable to recover the ensuing kickoff, and Tarleton needed only three plays to score from the Lion 2, making it a 40-21 lead to the guests with 12:59 to go. The Lions had their next two drives end in punts, and Tarleton’s Adam Berryman punched in a 6-yard touchdown carry to seal the final margin and give the Texans the President’s Cup for the first time in six years. Lions fall 3-1 at Angelo State. 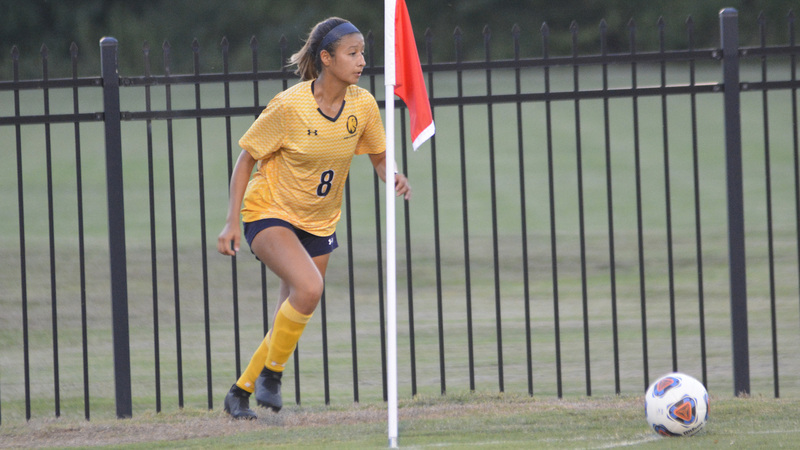 SAN ANGELO – The Texas A&M University-Commerce soccer team scored an early goal, but the Lions were unable to hold on to the lead in a 3-1 loss at Angelo State University on Friday night. The Lions fall to 6-5 overall on the season with a 3-4 Lone Star Conference record, while Angelo State is now 7-4-2 overall and 5-1-1 in league play. A&M-Commerce plays its final regular season road game at 1 p.m. Sunday at UT Permian Basin. -The Lions had an early advantage in shots, but Angelo State had a 16-3 lead in the shot tally. – Sabrina Munguia (Baytown – Lee) scored the Lions’ lone goal on a penalty kick in the 23rd minute. The goal is her fifth goal of the season. – Caitlin Duty (Crandall) made five saves in the game. The Lions were playing with 10 players from the 40th minute on. Neither team enjoyed much offense in the early going, as the Lions scored on the first shot of the contest. After A&M-Commerce drew a foul in the penalty area, Munguia buried the penalty kick in the 23rd minute for the early 1-0 lead. 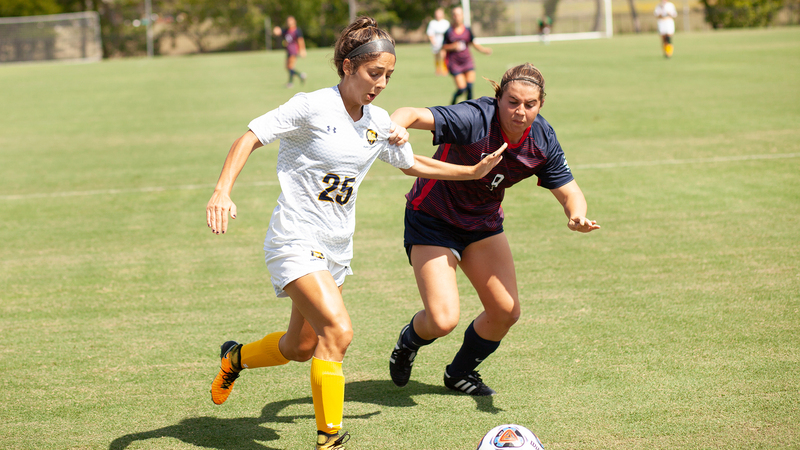 Angelo State didn’t manage a shot until the 30th minute, and the match took a turn in the 40th minute when the Lions went a man down after a red card. The hosts went on the offensive in the early portion of the second half, tying the game in the 48th minute on an Ally Warren goal. The Lions were facing the personnel deficit and were unable to muster much offense. ASU took the lead on a Chloe Souza goal in the 60th minute. The Lions then managed two corner kicks, but could not fire off a shot. ASU’s Trenadey Scott added an insurance goal for the Rambelles in the 74th minute. COMMERCE – This weekend’s Texas A&M University-Commerce football game weekend will feature numerous recognitions for the seniors of the 2013 Lions’ team who helped kickstart A&M-Commerce’s return to prominence. On Friday night, the 2013 senior class will have the team room on the second floor of Whitley Gym dedicated in their honor. They will also be recognized on the field between the first and second quarters of the President’s Cup game vs. Tarleton on Saturday. 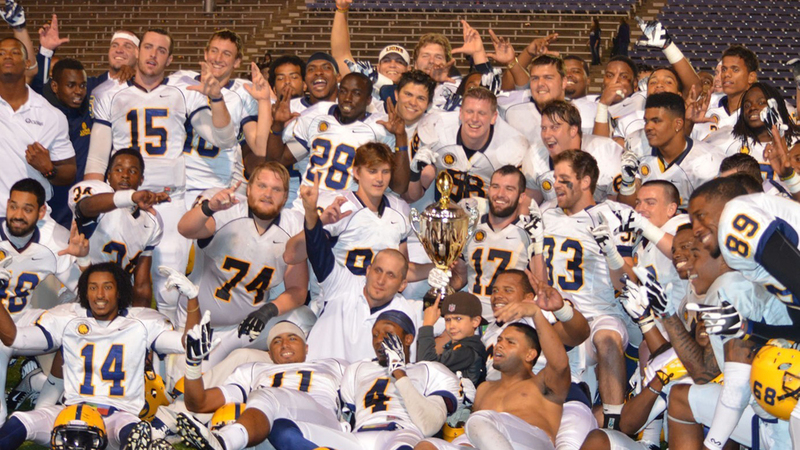 The 2013 season was the Lions’ first winning season since 2001, as head coach Colby Carthel led A&M-Commerce to a 7-4 regular season record, taking the Lions to the postseason. This weekend’s celebrations are especially appropriate, as one of the 2013 season’s biggest wins was the President’s Cup victory over No. 23 Tarleton. Tickets for Saturday’s game are still available by calling (903) 468-8756 or visiting http://WeAreLionsTix.com. The box office at Memorial Stadium opens at 11 a.m. Saturday for walk-up purchases. 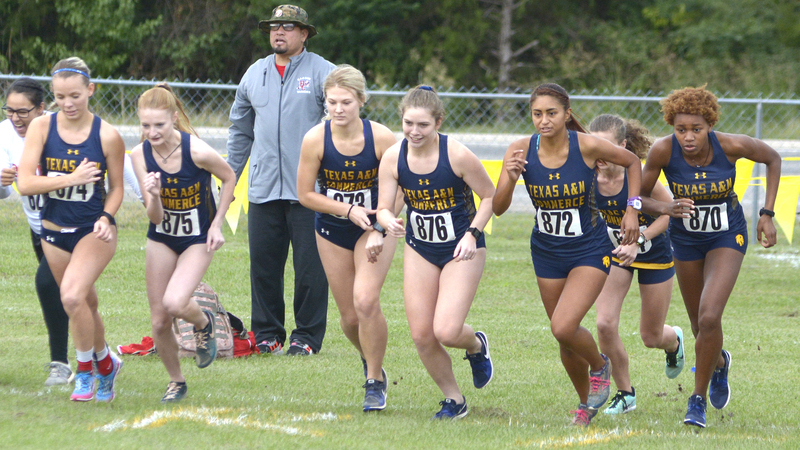 COMMERCE – The Texas A&M University-Commerce cross country teams hosted the East Texas Shootout in gray, drizzly conditions on Friday morning, with the Lion men claiming runner-up in the team race, and the Lion women placing third. The race was initially scheduled for a steamy day in September, but thunderstorms at that time delayed the meet until October. In the women’s race, Brandi Stalder (Sanger) placed fourth, finishing the six-kilometer course with a time of 22:46.3. Also in the top 15 meet scorers were Maddie Shubert (Rowlett) in 15th place at 24:43.5, and Mikayla Maldonado (Irving – MacArthur) in 17th at 25:19.5. Taylor Jones (Garland – North Garland) placed 18th at 25:33.3, Shelby White (Eustace) placed 21st at 26:18.2, Mallory Morgan (Katy) finished 24th at 27:20.3, and Ruth Leach (Whitesboro) placed 25th at 27:41.3. The Lions scored 67 points to place third behind Tarleton (30) and Dallas Baptist (34). In the men’s race, senior Evan Luecke (Forney) was in the lead pack for most of the race, finishing sixth with a time of 25:46.5. Garvin Chilton (Katy) placed 11th at 26:30.3 and Steeven Martinez (Mesquite – Poteet) placed 12th at 26:43.4. Edwin Aparicio (Cy Springs) finished in 15th place at 26:49.3 and Mason Boswell (Katy) rounded out the Lion scorers at 26:58.3 in 16th. Tarleton swept the top five places to score a 15 and win the team title, while A&M-Commerce scored 56 to finish ahead of DBU, which is ranked 11th nationally. The Lions have one more regular season meet, competing at the Angelo State Blue & Gold Classic on Tuesday, Oct. 23.